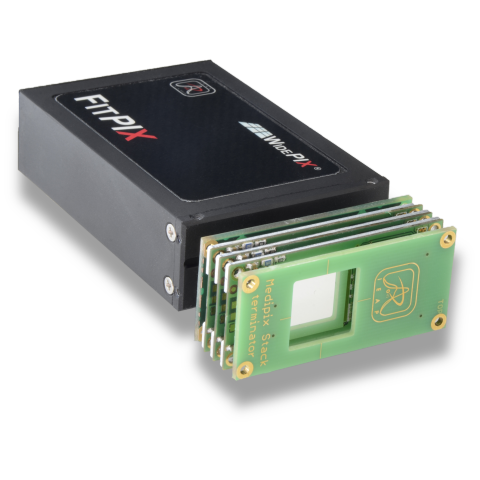 FITPIX Kit is a standard device used in many experiments including X-ray imaging, particle tracking and radiation monitoring. The system consists of FITPIX interface with speed of up to 100 frames per second (for single Medipix/Timepix detector layer), motherboard for imaging detector placement and single detachable Timepix radiation imaging detector with sensor according to customer preference (standardly 300 µm thick silicon). The system can be extended attaching further Timepix detector layers forming a particle tracker or multilayer imager. The system can be used in imaging applications (e.g. X-ray, electron, ion or neutron radiography) as well as for radiation monitoring where its ability to recognize individual particles, sort them to several basic groups (X-rays, electrons, alphas etc.) and measure their energies is utilized with great advantage. If more than single detector layer is used then also direction of particles can be determined. The system can be adapted for operation in vacuum. Variety of adapter cards exist for Timepix detector connection. The maximal frame-rate decreases with number of stacked detector layers.